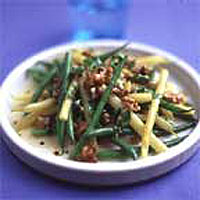 If yellow wax beans are unavailable, just use double the quantity of green beans. Bring two pans of water to the boil (salt them if you like but you may find the beans taste sweeter without salt). Top, tail and halve the beans. Drop the yellow beans into one pan and the green beans into another and boil vigorously, uncovered, until soft, but not soggy. The cooking time will vary depending on the size and texture of your beans, but as a guide yellow beans take about 5 minutes and green beans about 7 minutes - that's why it's necessary to cook them separately. Drain the beans and spread out to cool and dry on kitchen towels, on a couple of plates. Meanwhile, whisk together the sherry vinegar, walnut oil and finely chopped shallot in a large bowl. Season to taste. Tip the beans into the vinaigrette. Add the walnuts and, shortly before serving, mix in the parsley. Serve at room temperature.